It's that time of year again poets and poetry fans of Long Island. Bards Day 2013 will be upon us soon. Saturday, June 29th, 2013. 5-9:30PM. Save your seat and get 3 FREE raffle tickets at Bards Day! Preorders Are Closed. See You At Bards Day!! Bards Annual 2013 PreOrders Are Closed But You Can Pay At The Door! See You At Bards Day! PreOrder your copy of Bards Annual 2013 to pick up at Bards Day! Reserve your copy (copies) and get 3 FREE Raffle tickets and a Bards Day 2013 Pin at Bards Day! Note: We are only setting aside a limited number of PreOrders so reserve your copies quickly! 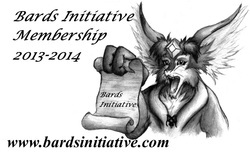 The Bards Initiative opens its membership drives twice a year. Bards Day is one of them! All Bards Members get into Bards Day and get a copy of Bards Annual for FREE. Membership is good for one year. -Access To "The Bards Gazette"
Preorders Closed--See You At Bards Day! !